With the passing of time, many once-thriving areas of old Nemasket seem destined to lose their identities, even their histories. One such area is Lakeville's Haskins Neighborhood, at one time a busy area of activity located at the junction of Bedford Street and Rhode Island Road. The Haskins Neighborhood took its name from Cephas Haskins (1825-96), a Lakeville native whose family was prominent in the vicinity until the first quarter of the 20th century. During the early 1800s, the Haskins Neighborhood (in what was then considered West Middleborough) hardly seemed poised for growth, despite its central location between Middleborough Four Corners and Precinct, and astride the Boston-New Bedford Turnpike (Bedford Street). However, the arrival of the railroad in December, 1846, placed the community on the Fall River Railroad's mainline between that city and South Braintree (and ultimately Boston). 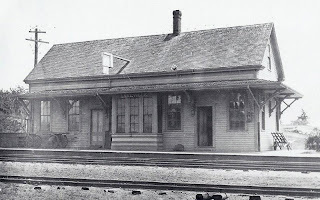 The depot established on Bedford Street would become the principal station serving what would become the town of Lakeville, and the neighborhood was frequently regarded as the "center" of the town. (The 1903 map of the town, in fact, labels the Haskins Neighborhood simply as "Lakeville"). 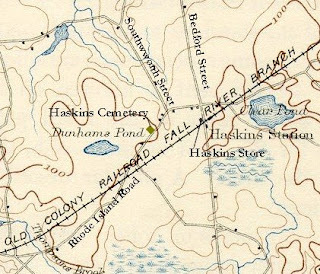 In 1857, the Old Colony Railroad (which had since taken over from the Fall River) raised a new depot to replace the earlier 1846 structure, and the stop became known familiarly as Haskins. Numerous Haskins family members lived clustered about the intersection of Bedford Street and Rhode Island Road, including Cephas Haskins who would serve as station and express agent for 39 years until his death. Additionally, Haskins was engaged as postmaster for Lakeville, and the small post office was removed to the 1857 depot upon that building's completion. The dual position of station agent and postmaster undoubtedly helped Haskins maintain a high visibility within Lakeville. "An independent in politics, he held the confidence and esteem of both parties, and was elected to several important offices of trust", including Selectman, Assessor, Overseer of the Poor and Massachusetts state representative. The growth of both the Tack Factory neighborhood to the north, and the area around the Lakeville Town House to the south also benefitted the Haskins Neighborhood which was conveniently situated nearly mid-way between the two. The Lakeville station brought considerable traffic to the area, so much so that in the spring of 1872, Haskins chose to build a store on Bedford Street, near both the depot and his homestead, to take advantage of the increasing activity about the area. The store was an important social center for the immediate vicinity, as well as Lakeville as a whole. Not only did the store retail a wide variety of groceries and dry goods, but the Lakeville post office was relocated from the depot across the road here. Additionally, following its reorganization in the spring of 1877, the Lakeville Library Association located its collection in the store, with Haskins' spinster daughter, Lydia ("Lizzie") K. Haskins (1851-1920) serving as librarian. The library, in fact, was largely a Haskins family affair: in addition to Lydia, Cephas' second wife Mary E. (Mason) Haskins (1834-1903) served as secretary, and his brother, Myrick (1814-87) as president. Besides establishing a profitable business trade, Haskins also helped develop the area by providing housing for his employees. In 1873, he constructed "a neat cottage near the Haskins depot ... for one of his workmen." In January, 1878, fire consumed Haskins' store and adjacent buildings "together with their entire contents, embracing a stock of grain, flour, groceries, patent medicines, boots and shoes and a variety of such other goods ususally kept in a country store." Additionally, both the post office and library which were housed in the store were destroyed. The estimated loss from the fire was placed at $10,000. The 1857 railroad depot, diagonally across Bedford Street, was also consumed in the fire. Despite this devastating loss, Haskins was determined to rebuild the store, which the Gazette stated, "will be good news to his numerous customers, and Mr. Haskins can rest assured that he will commence business with the best wishes of a host of friends." The store was rebuilt and photographs of the building show a two-story building with a sign reading "C. HASKINS CHEAP CASH STORE." As built, the store greatly resembled the new depot across the road, and the two were, in all liklihood, built at the same time by the same builder. The store is said to have been one of the largest general stores in this section of Plymouth County, with extensive delivery routes. Because of the successful nature of the business, though, the Haskins store apparently attracted burglars quite frequently. In April, 1877, the storehouse had been broken into and a barrel of flour and chest of tea taken. The new store, as well, would be subject to periodic break-ins: in October 1888, burglars rifled through the store at night, taking with them $75 in postage stamps from the post office and $25 worth of cigars, knives and other articles. Following Haskins' death in 1896, the store was closed after a while and the positions of station agent, express agent and postmaster were assumed by his spinster daughter Mary A. Haskins (1853-1932). "Her connection with these triple offices which touched upon the home life of nearly everybody about that section made her one of the prominent citizens of the town" as was her father before her. In this work, she was assisted by her sister, Lydia, who served as assistant postmaster. Despite the establishment of Rural Free Delivery in 1899 in Lakeville, the Haskins sisters were able to maintain the Lakeville post office until Lakeville mail was finally rerouted through the post office at Middleborough. Haskins Cemetery, Rhode Island Road, Lakeville, May, 2009, Michael J. Maddigan. Cephas Haskins Monument, Haskins Cemetery, Rhode Island Road, May, 2009, Michael J. Maddigan. Haskins Neighborhood map based upon 1893 USGS map, Michael J. Maddigan. Lakeville (Haskins) Station, Bedford Street, Lakeville, c. 1900, photograph. The photograph depicts the depot which was constructed following the 1878 fire by the Old Colony Railroad Company. Lakeville (Haskins) Station, Bedford Street, Lakeville, 2009, May, 2009, Michael J. Maddigan. 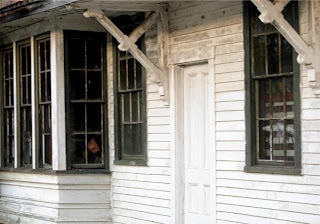 Detail, Lakeville (Haskins) Station, Bedford Street, Lakeville, 2009, Michael J. Maddigan. 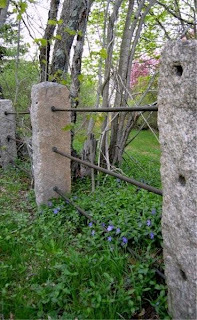 Granite and wrought iron fence with myrtle, Haskins Cemetery, Rhode Island Road, Lakeville, May, 2009, Michael J. Maddigan. 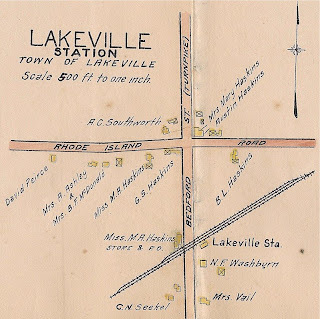 "Lakeville Station" inset, New Topographical Atlas of Surveys Plymouth County (Springfield, MA: L. J. Richards Co., 1903), plate 22 "Lakeville"